For most of you, spring is right around the corner with its beautiful sunshine. It certainly feels good. 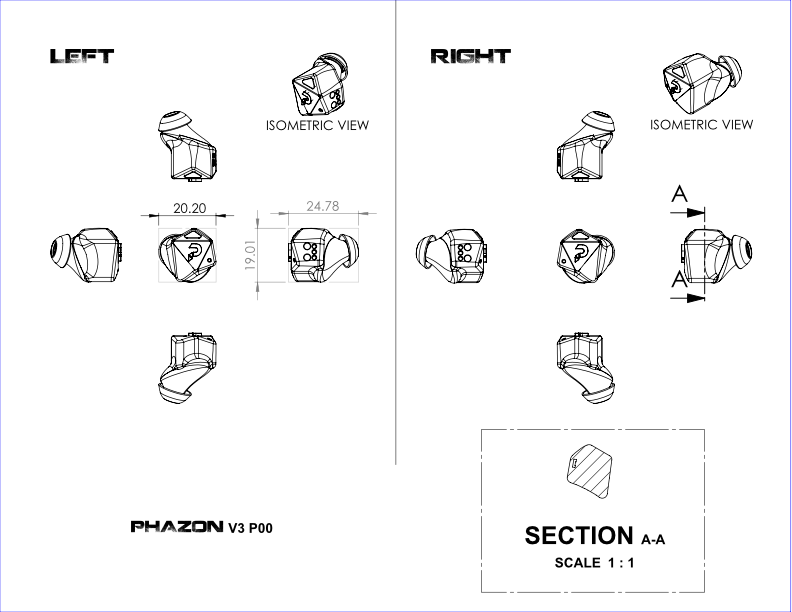 The other thing looking good is how the Phazon earbuds are coming to fruition. We’re glad to announce the final dimensions of the earbuds. We’ve been tweaking with it for a while to make sure we got the optimal size for the fit and audio quality. Going for a big size is a bummer for everyone, since the bigger it is, the less likely it will fit your ear. Ever heard of the quote “Less is more”? It’s totally the case for our product. Right below: earbuds’ dimensions – it’s basically 2cm*2cm*2.5cm (0.75in*0.75in*1in). We’ve made testings with lots of people and the results are amazing: it was a snug fit for 95% of the people. The industry standard for this type of product is 60%. The only downside is that making it this small dramatically increases the level of engineering constraints, especially for the antenna. Truth be told, the antenna still needs more fine tuning. Moreover, our senior engineer (Sylvain) is testing many different components configurations so the antenna quality becomes magnificent. This is time-consuming, as there are many potential configurations to test. Below is an example of how we test the earbuds’ connectivity. It took longer than expected to fine tune this one but we feel we’re very close to getting it done. Actually, the right configuration could happen in the very next few days. However, it could also take weeks. Once this is completed, we’ll shortly announce a reliable shipping date. So to recap, the final prototype is fully done, except for the antenna that needs a little more fine tuning to make it outstanding. The location app is under development with an experienced 3rd party provider. They’re currently working on the backend source code. Here are 2 early screens from what you could expect the location app to look like on the frontend side of things. We’ve ordered and received the PCBs for the advanced working prototypes. They are being assembled as we speak, so we expect to receive the fully functional prototypes by next week. You can see a glimpse of it by this CAD file. We implemented magnets in the charging case so when you put your earbuds in, they automatically snap to the wall, charging your earbuds smoothly and securely. Consider the charging case is a lot easier to build than the earbuds as we got less space constraints than the earbuds. We’ve been recently identified as one of the most innovative (top 50) sports startups in the world by the Hype foundation. This will provide access to major sports events (such as the NFL draft) and many great contacts in the sports area (such as top executives from Adidas).